Virtual reality (VR) typically refers to computer technologies that use softwares and hardwares to generate realistic images, sounds and other sensations that replicate a real environment, and simulate a user's physical presence in this environment, by enabling the user to interact with this space and any objects depicted therein using specialized display screens or projectors and other devices. In this article I would like to explore “how Virtual Reality works” and what is the basic principles behind virtual reality. Nowonly most of us are hearing about VR, but humans have identified Virtual Reality long before. Early versions of VR originated around 1930-40. The first references to the concept of virtual reality came from science fiction. Stanley G. Weinbaum's 1935 short story "Pygmalion's Spectacles" describes a goggle-based virtual reality system with holographic recording of fictional experiences, including smell and touch.After the invention of ‘motion pictures’ ,human’s thrive to experience real world virtually resulted in the invention of various Virtual Reality(VR) equipments. For the present generation VR is nothing but google cardboard or Oculus rift head-mounted display or HMD. HMDs typically take the form of head-mounted goggles with a screen in front of the eyes. Some simulations include additional sensory information and provide sounds through speakers or headphones. Virtual reality glasses or goggles are becoming increasingly popular in the gaming and entertainment arena. They are lighter and more comfortable to wear than the standard head mounted display (HMD). Ordinary glasses show a single image but 3D and virtual reality glasses contain polarised lenses which show two images, one per each eye. These images appear to give an illusion of depth of object we see. The basic principle behind 3D and virtual reality is stereoscopy. Two separate images are shown to each eye, which the brain combines into a single image. We are tricking our brain to perceive two slightly different images as a single image. Image given above is a snap of 3D VR video. Two images are combined to from a single frame. If you closely observe ,you can see there is slight difference in left and right images. Two slightly different angles of the scene is fed into each eye, simulating depth. This along with other ways to simulate depth like parallax (farther objects to you seem to move slower), shading and techniques create an almost a real world experience. 360 videos, also known as immersive videos or 360 degree videos, are videos recording of a real world panorama, where the view in every direction is recorded at the same time, shot using an omnidirectional camera or a collection of cameras. If 360 degree videos are played on your PC screen you can navigate through video using mouse or navigation keys. Using a wearable VR HMD ,You can watch different portions of video as you turn your head around which make it feel more immersive. Your head movement is detected using the gyro sensors on your smart phones. Along with 3D effect, 360 degree view will enhance Virtual Reality effect. 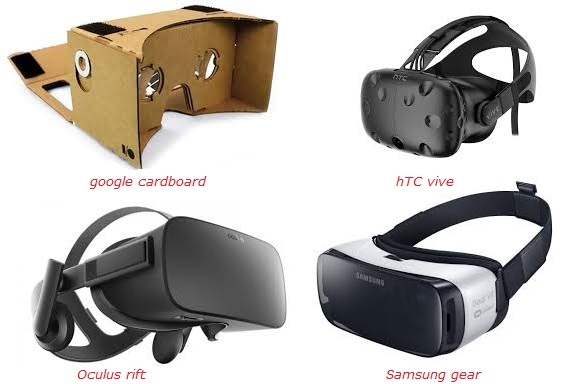 Now,different kinds of wearable VR equipments(HMDs) are available in the market.Google cardboard,Oculs rift,HTC vive and Samsung gear are the major players in the wearable VR HMD market.Google card board is the chepest one,but if you are looking for a real VR experience, go for Oculus rift or HTC vivo.Using a poorly aligned VR product may cause health problems like motion sickness. Augmented Reality: What is it and How does it works?